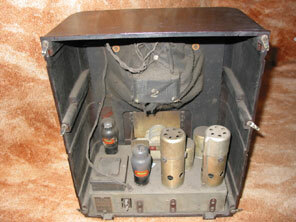 Shown here is the model AC Mains 4 from 1935, also known as BC 3630. This receiver is presented in a bakelite cabinet, but GEC are really aiming to match the design innovation already being seen at Ekco in Southend. GEC was probably the manufacturer most influenced by what they saw from Ekco, who had for a couple of years had some success charging premium prices for receivers in black bakelite cabinets with chromium trim that shared the same chassis with receivers also available in the more usual mottled brown bakelite. Therefore GEC decided that the liberal use of chrome fittings placed around a dark mottled cabinet might ensure success for them too. The idea never really bore fruit though, probably for two main reasons. Firstly, Ekco had engaged leading contemporary designers to provide interesting and innovative shapes for their new cabinets, whereas GEC cabinets were much less inspiring, even with the chrome additions. Secondly, and more prosaically, the receiver chassis's themselves from Ekco were arguably superior designs compared to the offerings from GEC. So to take a closer look at the AC Mains 4 cabinet, three chrome bars have been provided as protection for the speaker cloth, and each of the four control knobs has a chrome disc insert, a direct copy from Ekco. (At least Ferranti had the decency to make their knob inserts tracks rather than discs! see Nova here). It makes for quite a pleasing shape, but as mentioned, not as distinctive as say the ACT96 or AC86 from Ekco the same year. The tuning scale is calibrated in meters, but has no station names on it. 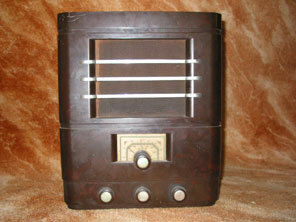 The receiver cost £9.9.0 in 1935, and was a 3 valve plus rectifier TRF receiver. By way of comparison the equivalent black and chrome Ekco receiver was the 3 valve plus rectifier TRF AD36 which cost £8.18.6, so in this case the GEC did not even have the price advantage. Valve line-up was VMS4, MS4B, N41, U12. Although rarer than equivalent Ekco black and chrome models of the era, without the cachet of the Ekco name on the cabinet the GEC chrome and bakelite receivers (this one and the AC37 seen on the next page) tend to attract lower prices today than Ekco "equivalents".